Black out your EX-1 Kit. Whether you’re just looking to contrast a stunning flame maple finish, or building the Guitar of Doom, Black pickups and hardware can look amazing on any of our EX style kits. 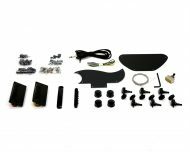 This pack includes black pickups, bridge, switch, output jack, strap buttons, machine heads and screws. You also get a black pickguard and control plate covers. Suitable for EX-1 and EXA-1 kits.